It deters that you define global functions without reason. You don't have to suffer from the global function that someone wrote. It is easy to remember. You'll be able to master even immediately. jQuery.Moxa only provides a simple rule. Let's use another library if desired a number of functions. You can get it on npm or bower. If you're not into package management, download a file. Include script after the jQuery library. // window.Moxa is assigned the object. be able to access of global. controller's function is executed from $(document).ready() or Ext.onReady(). jQuery.Moxa By is to implement the process for each role(controller, view..etc) to provide, is suppressed to be a global function definition. Each role function of the argument , or , is done via observer of jQuery.Moxa. And also it works to concat files and minify by gulp. Just observe the following rules, readability, maintainability will be greatly improved. Click event handler registration is done in the immediate function of View. The callback is run from the $(document).ready() or Ext.onReady(). Please implement the mainly call divided of view, ajax of execution, data processing. It can be only one registration. views: View objects that are registered with $.moxa.view(). You can notify the function that has been registered in the View. observer: By registering the object for reception in observer.set() function, you can receive notification of observers from View. The name, please specify a string that is easy to identify in Controller callback. The callback is run from the $ (document).ready() or Ext.onReady(). Please implement the mainly Click · DOM · CSS -related processing. View you can be multiple registration. controller: By registering the object for reception in controller.set() function, you can receive notification of observers from Controller. In addition, you can also call notifying the registered function in Controller. viewObserver: By registering the object for reception in viewObserver.set() function, you can receive a notification observer from another View. In addition, you can the child be notified by calling the registered function in another View. It will return false if the empty string, null, [ ]. It will return false if el is hidden(display: none). By passing an object that keys and functions as a set in it, you will be able to extend the Util. By keys and values ​​to pass an object as a set, you can be registered in the Def. When you register a URL · setting flag · message string , etc. It is convenient. This will contact the server at the GET request. This will contact the server at the POST request. By passing an object that keys and functions as a set in it, you will be able to extend the Ajax. 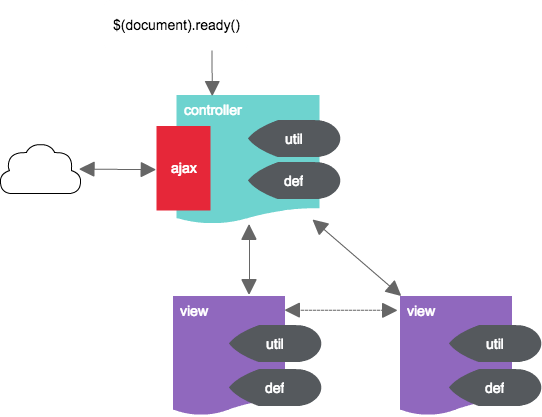 Common ajax processing, for example, it is useful to register and the like want to do a specific process in the request failure.